Installing Sewer pipe around 1909. Looking East. The IOOF building is near the left. The old library building is at the far left with the pitched roof (see photos). 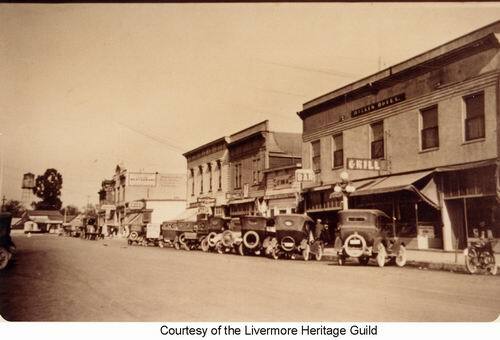 The Livermore Hotel is at the end of the street at an angle, with the flagpole at its right edge. This can just barely be seen at this resolution. Another vertical line just to its right is probably a mark on the photo. 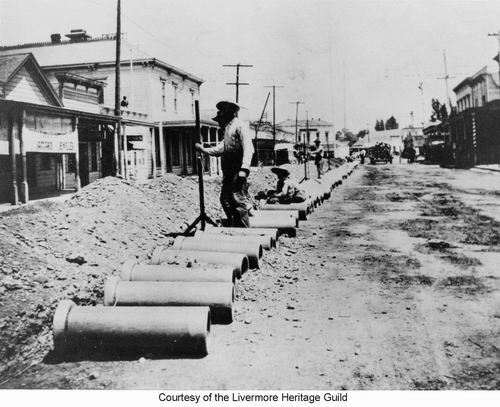 Installing Sewer pipe around 1909. Looking East. 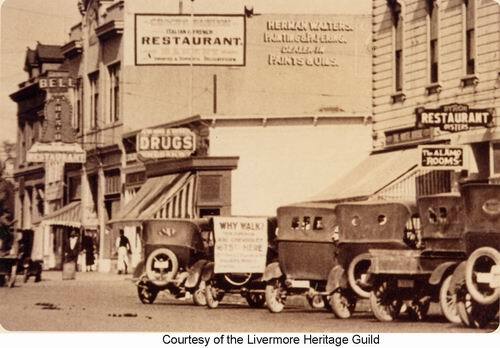 The Livermore Hotel is at the far left edge. 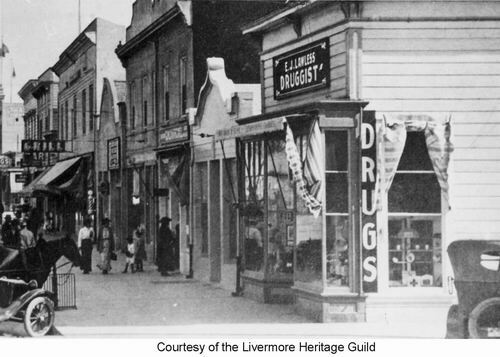 The far right building has sign that says "Livermore Restaurant" under the overhang. The top of the building reads "Mally's Block"
First St. at the corner of K looking east. About 1930. IOOF building on left. 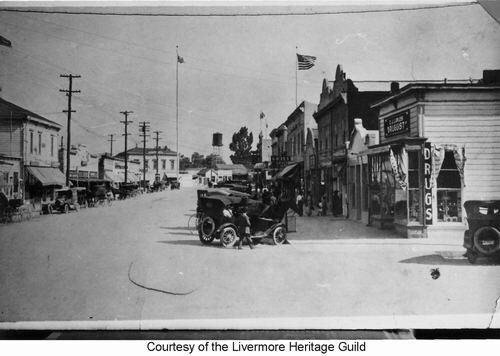 Livermore Hotel to the left of the flagpole. The other flag is on top of Mally's. E J Lawless Drugs is on the right. This is the same picture as above, but scanned from a different print which was cropped further. It gives a better look at the drug store. This appears to be the same original photograph as above, scanned from a different print which was cropped. The signs are much more readable here, even on the original print. Cars are for rent. The sign on the back of the car reads: "Why Walk? This ??? 4 PC Chevrolet $6.75 Here ??". The sign on the building on the right reads "Byron Restaurant - Oysters". Below that reads "The Alamo Rooms" The far left is the Masonic building, with the Schenone building (Bell Theatre sign) to its right. Signs on the side of the Schenone building read "Croce's Fashion Italian & French Restaurant - Bakery", "Imported and Domestic Delicatessen" and "Herman Walters Painting & Papering. Dealers in Paints & Oils". 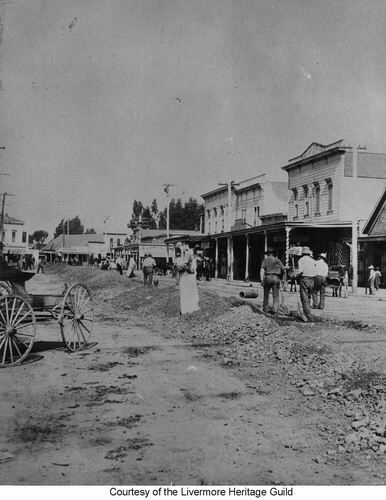 About 1920.